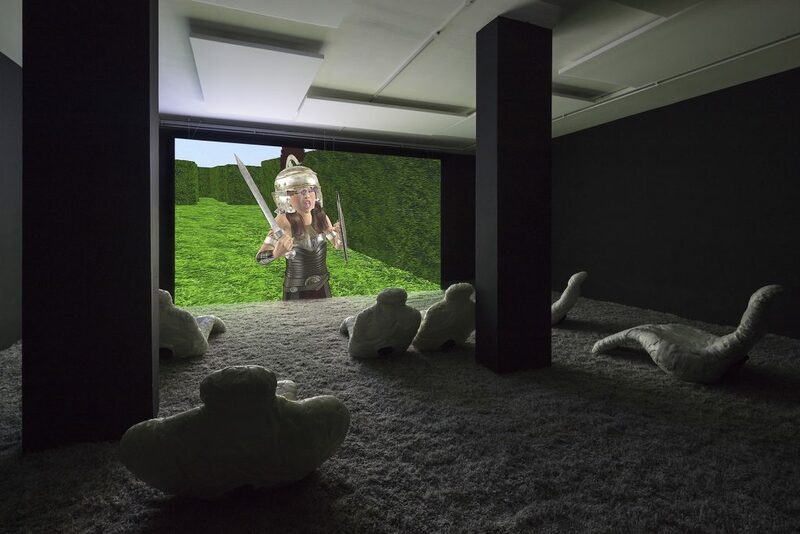 Sprüth Magers is pleased to present Jon Rafman’s first solo exhibition with the gallery. In Dream Journal 2016-2017, the latest iteration in his ongoing video series, he has created an immersive installation within the Berlin space. Rafman is recognized for an interdisciplinary practice that spans photography, sculpture, video, virtual reality, and installation. His work explores the impact of technology on contemporary consciousness, incorporating the rich vocabulary of online worlds to create poetic narratives that critically engage with the present. Dream Journal 2016-2017, segments of which have been drip fed through the artist’s Instagram feed over the past year, is an hour-long series of freeform narratives created using hobbyist CG animation softwares. In the video, two female protagonists embark upon a Dantean journey across strange landscapes and phantasmagorical spaces, encountering a host of recurring characters; often hybrids between human, monster and animal. Unconscious fantasies find voice through the vernacular of virtual worlds, as primeval, libidinous encounters unfold in a series of surreal sequences. The film is scored by experimental electronic musicians Oneohtrix Point Never and James Ferraro. 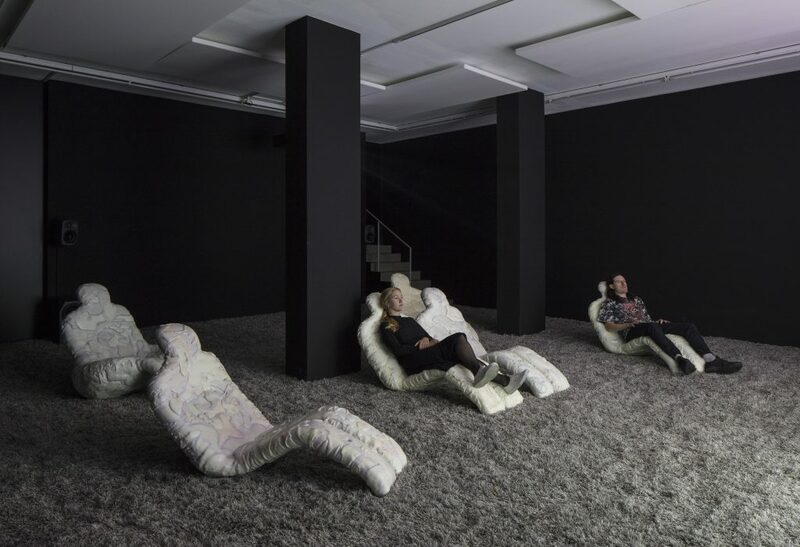 The video installation is completed with shag carpet and anthropomorphized sculptural seating. The chairs have been reengineered to appear both ethereal and abject with expanding foam surfaces; a similar softness is achieved with the dense carpet. The result is the creation of a liminal space that facilitates entry into the internet’s collective memory. Jon Rafman (*1981 in Montreal, Canada) studied Philosophy and Literature at McGill University in Montreal and received an MFA from the School of the Art Institute of Chicago. His work examines the relationship between technology and subjectivity. 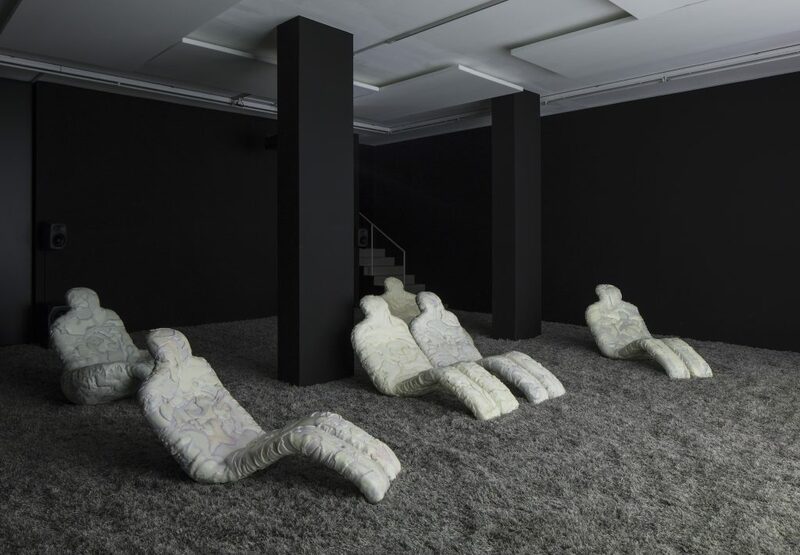 Rafman’s recent solo exhibitions include I Have Ten Thousand Compound Eyes and Each is Named Suffering, Stedelijk Museum, Amsterdam (2016), Westfälischer Kunstverein, Münster (2016), Musée d’art Contemporain de Montréal (2015), and The Zabludowicz Collection, London (2015). His works have been featured in prominent international group exhibitions, including Suspended Animation, Les Abattoirs, Toulouse (2017), Berlin Biennial 9 (2016), Manifesta Biennial for European Art 11 (2016), The Future of Memory, Kunsthalle Wien (2015), Speculations on Anonymous Materials, Fridericianum, Kassel (2015), and Biennale de Lyon (2015). He recently created a video for a production of Albert Ginastera’s opera Bomarzo at the Teatro Real, Madrid (2017). The Berlin gallery is concurrently presenting exhibitions by Barbara Kruger and Llyn Foulkes. Berlin, September 16 – December 22, 2017.